This is a guest post from Jodi McIsaac Martens. I used to think I had no imagination. None whatsoever. I wanted to have imagination, of course, and I really, really enjoyed the fruits of other people’s imaginations, but I was quite convinced I had none myself. Not exactly the ideal trait in a novelist. This misapprehension persisted until after I had started working on this current novel. I was fairly confident in my basic writing ability (I’ve made a successful business out of writing, after all, so I couldn’t be completely horrible), but I was terrified that my book would be completely unreadable because I wouldn’t be able to think of anything interesting to happen in it. And then I was introduced to the concept of 20 Bad Ideas. It’s quite simple, really. The general premise is that it’s impossible to come up with 20 good ideas. But it’s equally impossible to come up with 20 bad ideas. So let’s say you need an idea – either a big one like “what’s this story going to be about?” or a smaller one like “what should be the target of my terrorist/villain’s attack?” When trying to make these kinds of decisions or come up with new ideas, it can be far too easy to grab the low-hanging fruit – choosing whatever comes first to you or settling for an idea that is common to the point of cliché. Instead, try to come up with a list of 20 different options. They won’t all be good, but they won’t all be bad – and you’ll have pushed yourself and your imagination into coming up with some ideas that just might surprise you (and your readers!). I used this method over and over again while developing my story – to determine magical devices, how characters die, plot twists and even backstory. Sometimes it was easy to come up with 20 different ideas; most of the time it was agonizing. But every single time, the idea I ended up with after this exercise was WAY better than the one I started out with. So if you find yourself stuck for a fresh idea or feeling generally uninspired, try brainstorming 20 bad ideas – you might be surprised at how much imagination you have! Jodi McIsaac Martens is a freelance copywriter and owner of Inkwood Communications. She blogs at www.jodimcisaacmartens.com and is currently putting the finishing touches on her first novel. And yes, it involves portals. 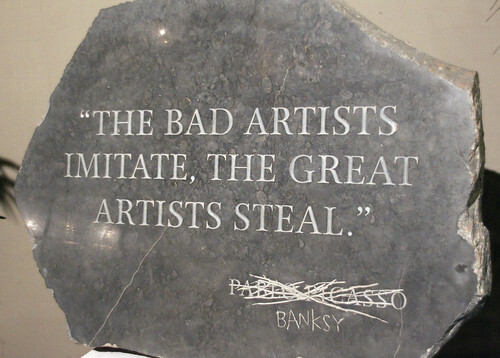 Why Do Great Writers Steal? I was asked on a teleconference the other day, “What do I do if I am stuck in writing my book?” and I referred to this quote. I am also making my way to the mid-point of NaNoWriMo and the well is getting a bit dry for my first fiction novel. So what does it actually mean? Steal ideas. Read other people's works, or look at other people's art work. If you like an idea, ruminate on it, muddle it around in your brain and see where it ends up. Write the same idea in your own words and you can bet it will be a different story or a new angle on it. Steal other people's experiences and write about them for plot. Steal their words as they speak to help your dialogue. How many books about the end of the world are there? How many unrequited love stories? How many quest adventures? Steal words. Stephen King advises writers to read, and presumably most of us love doing just that! I am constantly reading, on the iPhone and physical book and now on the Kindle (I carry all with me!). If you are reading something and find a new word, or a description or phrase, or a poetry line, then write it down. Maybe you can re-use the word in a different context, or it helps you describe something in a better way. Steal chunks of work and remix it. There is a lot of work released under Creative Commons licensing now, which means you can legitimately ‘steal' it and remix it and draw inspiration from it. This is a great source of ideas and content. Remember to check the licensing as to what you can do with the work though. [This blog content is CC licensed as below right]. Don't steal chunks of copyrighted work. This is plagiarism! Of course, T.S. Eliot did not mean copy other people's work and pass it off as your own. Don't copy down chunks of Wikipedia and claim them as your words. Our brains are a mass of connections and if you add something new into the mix, you will spark new connections. An old idea can be recycled into a new one, with a new twist. Shakespeare took his ideas from so many sources and wouldn't we all love to write tales like his? Idea for this post stolen from Jeremiah Abrams at his writer's weekend. Also discussed in the sci-fi/fantasy podcast with Pip Ballantine, J Daniel Sawyer and Chris Lester available here.